If you plan on sharing this classic comfort food, you’d better be comfortable receiving a compliment. Because our classic Pot Roast is fork tender, melt-in-your-mouth delicious. Prepared with its own natural, rich gravy, just heat, serve and listen to the table get oh-so quiet. (Conventional Oven) Preheat oven to 350ºF. Pour contents of cooking bag into an oven safe dish. Add 3 tablespoons water. Cover tightly with foil and heat tor approximately 25 to 30 minutes. (Microwave) Open end of bag with scissors and pour contents into a microwaveable container. Cover tightly and microwave on high for 7 minutes. 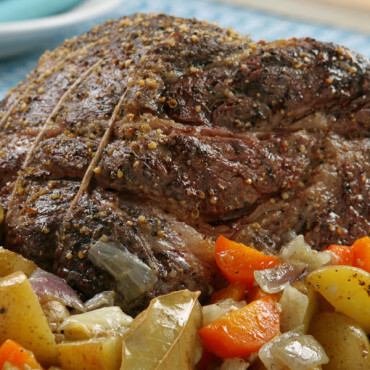 Carve pot roast against the grain and serve.